The IBM InfoPrint 4000 High Speed, High Resolution Duplex Printing System (models IR3/IR4) helps you meet your future printing needs by providing improved productivity, reliability, flexibility, and investment protection. The InfoPrint 4000 IR3/IR4 gives you the flexibility of printing traditional production applications at up to 17.4 million impressions per month (IPM) with speeds of up to 708 duplex (8.5 x 11 2-up printing) at either 480 or 600 dots-per-inch (dpi). This means you can run your 240, 300, or 600 dpi datastreams all on the same printing system in either duplex or dual simplex mode. The InfoPrint 4000 IR3/IR4 also offers you a solution for printing publishing documents for just-in-time manufacturing environments in duplex mode at 600 dpi resolution. Since performance is the foundation for productivity, the InfoPrint 4000 IR3/IR4 is provided with the latest Advanced Function Common Control Unit (AFCCU (TM)), which offers many new productivity and performance features as standard. 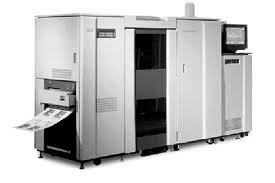 These include 1024 MB memory, an enhanced post-processing interface that will enable paper jam recovery to the end of your post-processing equipment, and many other operator aids that will enhance speed and productivity. Choose the printer and features that best suit your business today, with the confidence that you can upgrade to keep pace with business changes. Meet print windows with consistent throughput and reliable job completion. Increase your flexibility to support complex applications at greater distances. Enhance your operational productivity and control with the ability to log on and manage print jobs and queues from the print room, as well as authorize operator tasks. Improve overall forms management by verifying that the correct form is loaded. Simplify and expedite the way you move products through your supply chain, retail store or manufacturing/distribution center with information-packed, highly readable 2D barcodes.